3.3.07. LIVERPOOL V MANCHESTER UNITED. When Sir Alex Ferguson announced his retirement as manager of Manchester United on 8th May 2013, he left behind a legacy that can arguably never be surpassed. 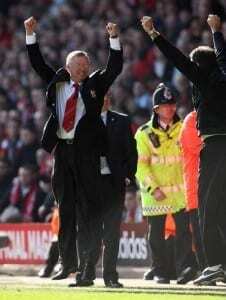 He had been in charge at Old Trafford for almost 27 years. Ferguson was born in Govan near Glasgow on 31st December 1941. His playing career began as an amateur at Queens Park from where he went on to play at St Johnstone from 1960. It was here he was noticed by professional club Dunfermline Athletic and he signed with them in 1964. Ferguson scored 66 goals in 98 appearances before being signed by Rangers for £65000 three years later; a record transfer fee between Scottish clubs. At Falkirk from 1969, he dabbled with management as player-coach and went on to end his playing career at Ayr United in 1974. Ferguson began his managerial career at age 32 with East Stirlingshire in a part time capacity for £40 a week. He had already gained a reputation as a disciplinarian when accepting the job of manager at St Mirren. Between 1974 and 1978 he transformed the club, discovering a number of young players who took the team from the lower half of the Second Division to First Division League Champions. In 1978 he took over at Aberdeen, where he got his first taste of European glory. It's said that Aberdeen's players nicknamed him Furious Fergie, but his style worked: league and cup victories came to the club during the early 80s, and Ferguson's side became just the third Scottish team to win European silverware when lifting the Cup Winners' Cup in 1983. Awarded an OBE in 1984, Ferguson was brought south to take on the challenge at Manchester United in 1986. Opinion was split after 3 trophyless seasons, and it's claimed that Ferguson was one game away from the sack in 1990. By the end of the season, United were FA Cup winners. Ferguson would prove his worth by going on to win an incredible 2 Champions League titles, 13 Premier League titles, 5 FA Cups, 4 League Cups and 1 European Cup Winners' Cup. His legacy as the most successful football manager in British history was secured not only by the number of trophies he won but also by how he transformed the club and helped them to become one of the greatest global teams of all time. His ability to build numerous successful squads over the years, blending home-grown talent with global superstars, has seen Ferguson overcome the doubters at many points during his tenure. While fans were sad to see succesful players such as Paul Ince, Andrei Kanchelskis, David Beckham, Ruud van Nistelrooy and Cristiano Ronaldo leave the club, Ferguson always knew how he would bring new talent in. More often that not, another trophy-winning season would follow. Just some of the remarkable statistics applicable upon his retirement in May 2013 include a total of 49 major trophies won under his guidance, 24 players who have graduated through the United academy and have gone on to play for some of the best clubs in Europe, and a record number of 28 wins in a Premier League season in 1999-00, 2006-07 and 2008-09. He won Manager of The Year 10 times, and Manager of the Month 27 times. There is now a Sir Alex Ferguson stand at Old Trafford and a statue outside the ground. Sir Alex is Vice-President of the National Football Museum. Since being one of the inaugural managerial inductees to the National Football Museum Hall of Fame in 2002, he went on to win a further 17 trophies for his club.